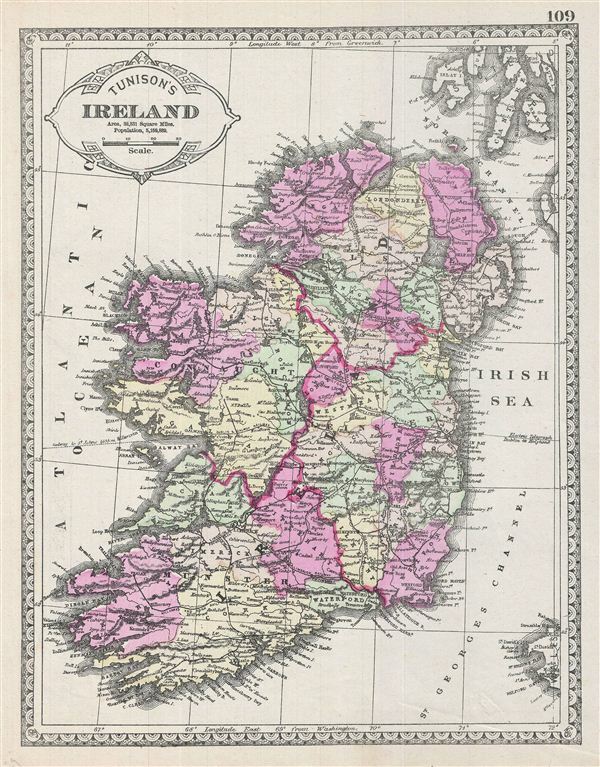 This is a beautiful example of the 1887 Tunison map of Ireland. The map covers the emerald Isle in full from Donegal to Cork. Ireland is divided into its four primary provinces, Munster, Ulster, Connaught and Leinster. During the 19th century, Ireland suffered a series of famines, the worst one being the Great Irish Famine, which lasted from 1845 – 1849 and killed about a million people. As a result it witnessed a widespread exodus. By the end of the 19th century, almost 50% of immigrants into the United States were from Ireland. The map is highly detailed with color coding at county level. Various towns, cities, rivers, roads, railways, and various other topographical details are noted. Published as plate no. 109 in Tunison's Peerless Universal Atlas. Very good. Map of France on verso. Minor damage and verso repair in bottom right quadrant.